I’ve enjoyed most of Nicole Holofcener’s movies (“Please Give”, “Friends with Money”) but she has outdone herself with “Enough Said”. Her characters are real, richly drawn and utterly believable. With a light of comic touch, and without a whiff of pretension, she manages to explore some of the craziness of adult relationships, creating superior entertainment. Her leading lady, Julia-Louis Dreyfus is a socially awkward single mom. 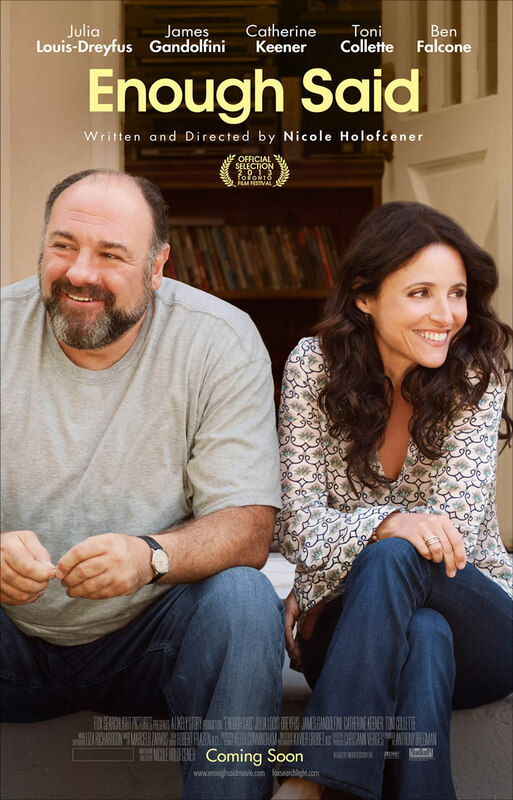 One night she meets a reserved man with a unique sense of humor (the late James Gandolfini in a one of a kind performance). How this relationship develops is the heart of “Enough Said”, a delightful romantic comedy with a serious undertone. Both characters are so well written, and so perfectly played, that we find ourselves rooting for them from the word go. The same can be said for Toni Colette, Catherine Keener, Ben Falcone and the other actors who make every moment of their brief screen time count. A clever screenplay and a talented director help a lot, but everyone involved in this movie seems to be having a great time. “Enough Said” is the work of a writer-director who earns the highest praise I can give. Do not miss this movie.